It's Valentine's Day. We're not sure if you could find a more romantic spot to spend it. It was slightly cloudy when we woke up, but by breakfast, the sun is pouring into the hotel dining room. It's a glorious day. 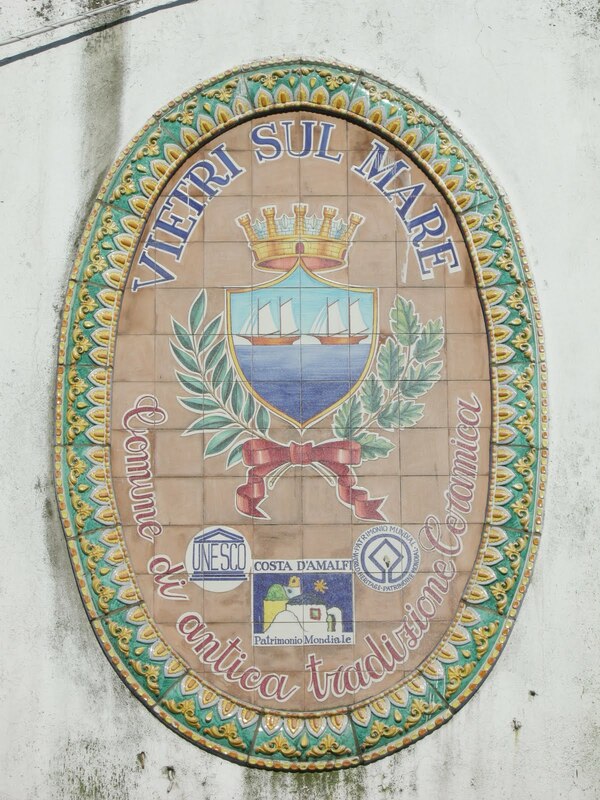 We're off to Vietri sul Mare, home of classic ceramics from this part of Italy. In the town of Vietri sul Mare we find shop after shop and factory after factory, many selling the same items. The Campagna pattern made famous in the US by Vietri is everywhere. We find we're actually able to get better pricing and quality dealing with importers from the US. There are definitely artisans in this town, but they're few and far between and they're priced in the stratosphere. It's an interesting experience, though, and it leads us on an excursion that ends in the best meal we've ever had in Italy! We've been here many times and we've had some amazing meals, but today will go down in the annals of Stephen/Frank history as one of the best anywhere. Driving down the coast earlier in the day we had passed Il Faro di Capo d'Orso. We had read about it as being a good restaurant so we put it on the list of options for lunch. It would depend on how long it took us to get to Vietri, how long we stayed, when we started back, and if we found something else along the way. It was just before 1pm when we came back by in the other direction. It's the very earliest of the Italian lunch hour so it was possible they weren't even open yet. We walked in and inquired about a table. The gentleman at the desk picked up the phone and called to someone. In perfect English he told us they could take us "right now" but later they were booked. We weren't sure if that meant we had to eat and then get kicked out when someone else needed the table, or if he meant we could have lunch but that they were booked for dinner. We didn't really care. Just from what we could see at the doorway, this had to be a special place. The entrance to the restaurant is just a small rotunda off a small parking lot on the side of the road perched on the ocean side of a cliff. We were first escorted down a wide staircase into the main dining room. Every table was empty. Hmmm. We knew we were early but it seemed strangely void of any kind of life. Then through a set of double doors, down a few steps onto a terrace. Again, totally empty. Here we thought maybe we were going to be seated at an outdoor table since maybe everything in the main dining room was booked. Again, no servers, no help, no anything and no stopping here either. Down another path and a few more steps and we were at the door of another building, this one a mix of stone and steel, ceramic and glass, contemporary and classic. And did we mention the view? Miles of coastline stretching out before the wraparound windows. Here we were greeted by one of the owners who showed us to our table - one of only 12 in the room. And just to be clear - our table for the afternoon. Everything about the room was perfect, from the crystal and silver, the linens, the contemporary Italian lighting, the soft piano music in the backgound (which had accompanied us all the way from the entrance), and again, that view. Menus arrived as did a waiter with perfect English. We really enjoy deciphering menus in a foreign language - it's part of the fun and adventure of traveling to another country - but sometimes it's nice to be able to ask what some unknown ingredient is. On the other hand, sometimes it's better not to know. We'll get to that in a moment. Frank decided on the "Ravello" menu - an assortment centered on "the land". 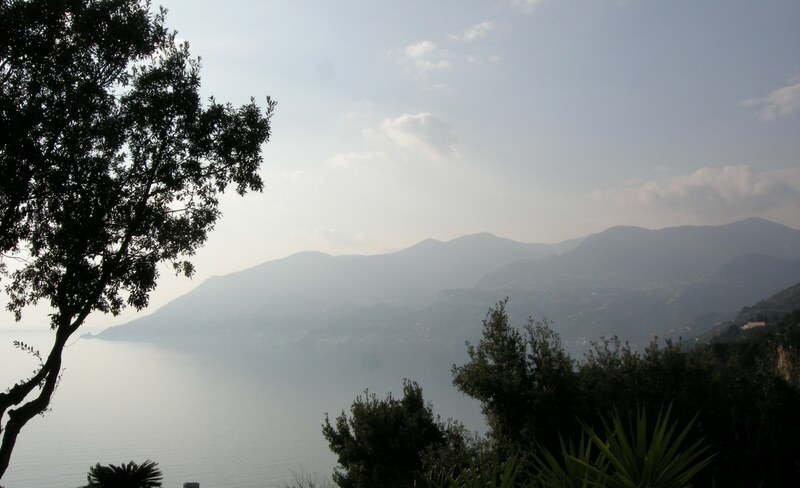 The other menu, other than the gastronomic choice, was the "Amalfi" which centered on "the sea". Stephen ordered a la carte. A bottle of Primitivo from Puglia would be a great accompaniment. We were first presented with the house appetizer, cured tuna, fresh cuttlefish on couscous and topped with sliced beets. The cuttlefish wasn't Frank's favorite but overall an amazing dish. Full of flavors and (like everything we would have today) unlike anything we've ever had before. Next for Frank Tortelli con riccotta di bufala dolce e salata, tartufo nero, salsa di porri e lampredotto al peperoncino piccante. Rich egg pasta filled with sweet ricotta, in a sauce of fresh green leeks and the spiced lampredotto. The lampredotto will be one of the things you eat, you're glad you ate, you thought the flavor was amazing, but you really wished you hadn't asked what it was. Seafood? Vegetable? This one we'll keep a secret. For Stephen, Tataki tono e foie gras mi cuit, carpaccio di rapa rossa, grue di cacao e pistachio. We've had versions of this dish on our travels, but something about this one was extraordinary. The raw tuna stacked with the foie gras, a light touch of sea salt between the layers, was served on a bed of paper thin sliced sweet red beets, strewn with a few leaves of arugula, matchsticks of apple and chopped pistachio and cocao bean. This is where writing can't translate to flavor. We can try but just putting all those flavors together created something so very special. There's more to come. This time Frank is having beef. Not just any beef, but a perfectly cooked filet topped with thick slices of black truffle and topped with a slice of smoked mozzarella baked in bread crumbs and pine nuts. All on a bed of soft polenta. For Stephen, a Ravioli filled with pork meat (again, we won't talk about from what part of the pig) with the same sauce of leeks and vegetables that Frank had on his pasta, but this time with sweet succulent shrimp, a small amount of heavily spiced dried bread crumbs and a tiny sprig of fresh wild sage flower. The texture of the shrimp was so unusual. They were just barely cooked. They were soft, almost, yet still firm. If you had a shrimp in the US with that texture you might think it was bad but these were out of this world. Frank's meal included a dessert. Stephen decided he'd just share Frank's. It turns out to be a good choice since over the next 1/2 hour we're going to be overwhelmed with sweets. First comes a dessert. Not really THE dessert, but a pre-dessert - for both of us. A slice of baba with a creme of pistachio, and a lemon custard. Next comes the real dessert. A hazelnut mouse enrobed in dark chocolate, a hazelnut ice cream rolled in crushed hazelnuts, and a passion fruit sauce. Then, an espresso. But not just an espresso, but an espresso with a tray of 10 petit fours. We may both go into sugar shock. Time to head back up the hill to the car and the winding drive home. Even the crazy drivers can't stress us out after such a great lunch. This one if for the history books.